With the mini skid steer buckets, you can load, dump, dig, grade, transport and unload materials safely and easily. 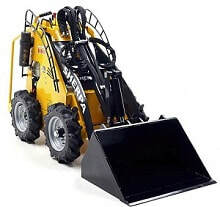 The mini skid steer loaders have optimum power which results in excellent performance. Attachments such as the buckets will help to complete arduous and demanding tasks quickly and effectively, saving time, labour and money. 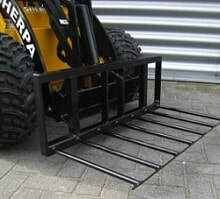 Because of its compact size, the mini skid steer is suited for narrow, tight areas, and its high lifting power together with the great loading capacity of the bucket attachments makes it perfect for farming, landscaping and gardening projects where access is restricted yet strength and pushing force is required. The 4 in 1 buckets can move, haul, dump sand, soil and gravel, plant trees, clear land, create paths, move pallets and wood, dispose of pruning and level surfaces. 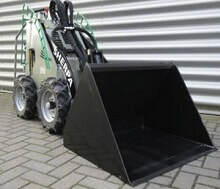 These skid steer buckets are also suitable attachments for the 150 mini loaders. Capacity 127 L/Weight 70 Kg. Width: 1120 mm. Height 380 mm. Depth 392 mm. Capacity 98 L/Weight 70 Kg. Capacity 87 L/Weight 64 Kg. Width: 760 mm. Height 564 mm. Depth 392 mm. 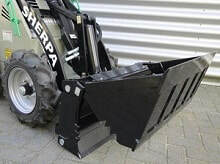 The mini skid steer buckets with grab are designed for moving manure, straw, silage, sand and other loose materials. 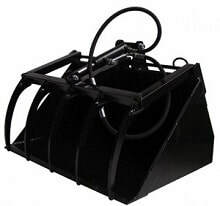 These mini skid steer buckets are not suitable for grabbing hard objects such as wood or stone. The mini skid steer buckets from the Volume range are designed for moving sand, soil, gravel and other loose materials and for transporting and levelling areas within narrow spaces. Slab bucket (00627) designed for breaking open 2 x 60/60 tiles. Slab bucket (00625) designed for breaking open (4 to 6) 30 x 30 tiles. 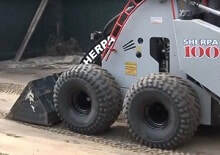 These mini skid steer buckets are designed for tiles and slabs. Pin bucket (30090) for breaking open tiles and other materials from surfaces. 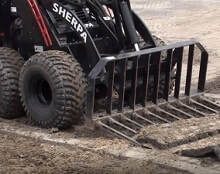 Our mini skid steer offers a whole range of attachments for different users.